Anglo-Saxons are a forgetful people. It was ever so, from their beginnings as a collection of tribes, morphing over time into the most influential of nations on Earth. So it is that in the great debate over whether or not Australia should become a republic, the true origins of the nation—the real foundation of its greatness—are seldom spoken of. It’s almost as if the years of brainwashing by an intelligentsia conditioned to the denigration of Australia’s British heritage by such pseudo academics as the anti-historian Geoffrey Blainey have wiped any memory of this great tradition from the collective mindset of generations of Australians. No doubt a principal reason for this is that most Aussies remain ignorant of the fact that Terra Australis was always destined to become a nation due to a specific act of Providence. The founding fathers of the Australian nation were aware, to an extent, of the hand of Almighty God guiding its affairs. Being aware of such, they acknowledged that guiding hand in the basic documents of federation. Still, even they were not fully aware of the extent to which the Eternal God willed the nation of Australia into existence. Up until the early 18th century, the great south land, identified as the land of Sinim (Hebrew for “a distant Oriental region”) in the prophecy of Isaiah (49:12), was loosely deemed as Terra Australis Incognita, the unknown land of the south, generally defying the attempts of explorers up to that time at full discovery of its presence in the vastness of the Pacific Ocean. In the mid-18th century, the confluence of what Australian historian Alan Frost describes as “new outlooks, new technologies and new reasons for venturing” (The Voyage of the Endeavour) at a time when a remarkable Yorkshireman, Captain James Cook, had reached the full maturity of his seamanship, was to finally lead to the discovery of the island continent of Australia. The timely invention of the sextant in 1730 and the first accurate marine chronometer in 1761 allowed for a degree of precision in navigation unheard of to that time. So it was that in 1768 Cook had these new instruments at his disposal when he received orders from the British government to undertake an explorative voyage with the intention of completing the discovery of Terra Australis. Following his charting the entire coastlines of New Zealand’s two main islands between October 1769 and March 1770, Cook, turning west, sighted the east coast of Australia on April 19, 1770. He subsequently landed at Botany Bay. Terra Australis was incognita no more. The timing of Australia’s discovery, and its subsequent claiming by Cook as a British possession, may have seemed propitious in the eyes of the British government at the time, coming as it did when the spread of Britain’s trading empire was expanding to the point of needing bases in and around the Pacific Ocean to complement its trade across the Indian and Atlantic oceans. Yet it was more than just propitious. It aligned perfectly with the unfolding of a plan for the colonization of a good part of the world by a nation of island peoples—a plan that had been prophesied over 3,700 years beforehand! Speaking to Abraham, the patriarch of the nations of Israel, Almighty God declared way back around 1730 b.c, “I am God Almighty: be fruitful and multiply; a nation and a company of nations shall be of thee, and kings shall come out of thy loins” (Genesis 35:11). One great nation and a great company, or commonwealth, of nations were to descend from father Abraham. This is a prophecy of the coming of the United States of America to global power status and of the history of Britain as the mother of a great Commonwealth of Nations. Ample proof of this fact is given in Herbert Armstrong’s book The United States and Britain in Prophecy. But what we want to point to here is the timing of the discovery of Australia, destined as it was to become one of the most blessed of nations within that great Commonwealth descended from the patriarch Abraham. These great promises were reiterated to Abraham’s progeny—Isaac, Jacob and Joseph. They were ultimately delivered to Joseph’s line, through the descendants of his sons, Ephraim and Manasseh. But God imposed a substantial time delay between the time of the giving of those promises to the sons of Joseph and their actual receipt by their modern-day descendants. The delay was occasioned simply because of the innate forgetfulness of the peoples of ancient Israel, descendants of the patriarch Abraham. Over time, distracted by the pagan practices of surrounding nations, they simply forgot their God who had promised them matchless blessings for the obedience of their forefather Abraham to His Creator! The result was national enslavement and the concomitant loss of national identity. Thus, following a prophesied delay of 2,520 long years from the time of Israel’s captivity, all of a sudden, beginning in the period 1800 to 1803, the island nation of Britain—home to the descendants of Joseph through his son Ephraim—burst onto the world scene to rise as the leader of the British Commonwealth and Empire. “A section of one of the greatest races of history”—stout words but patently true. That race is British to its core. The peoples which founded and pioneered Australia were but an outgrowth of the “Brith-ish” folk—Brith ish meaning “covenant man” in Hebrew—of whom the Eternal God had prophesied that by right of birth they would possess the choicest parts of the Earth, including the major sea and land gates to give them a strategic advantage second to none (Genesis 22:17). The island continent of Australia is simply one such great blessing, bestowed upon the British peoples in fulfillment of the great promises God made to the patriarch Abraham due to his conscious choice to obey God under the most extreme of tests (verses 15–18). As Andrew Roberts concisely explains in his eloquent, best-selling history of the English-speaking peoples and their impact on this globe, “English-speaking colonization, principally of … the United States but also crucially of Canada, Australia, New Zealand and the Caribbean … has succeeded triumphantly …. [T]hose states represent the last, best hope for mankind. … [T]he spread of the English-speaking peoples’ political culture has been the most significant historical development since the invention of gunpowder and the printing press” (A History of the English-Speaking Peoples Since 1900, emphasis mine throughout). Those who clamor for the establishment of an Australian republic—an Australia divorced from the stabilizing influence of the Crown—would seek to cut Australia off from the very institution that is fundamental to all that the Australian nation has represented through the 220 years since Captain Arthur Phillip settled the first colony of English-speaking peoples on Sydney’s shores. For as Andrew Roberts unabashedly declares, it is those very institutions established in the name of the Crown in the British dominions—Australia being among the most patently and richly blessed in the extent of the development of its natural resources—that combine “the best aspects of sovereign independence with the advantages that come from their deep historical, linguistic, cultural and often familial ties with what used to be termed without self-consciousness ‘the mother country’” (ibid.). There is a greater depth in that statement than even Roberts comprehends, for it involves another even greater promise made by God to Abraham: “Seeing that Abraham shall surely become a great and mighty nation, and all the nations of the earth shall be blessed in him” (Genesis 18:18). This latter promise has to do with the salvation offered by God to all peoples. But note, it is offered through the progeny of Abraham! Yes, Jesus Christ Himself, as we know, descended in the flesh from the tribe of Judah, of the family of Abraham. But there’s more! It was through the descendants of Abraham, the English-speaking peoples of the world, that the knowledge of the Word of God was largely disseminated, the Bible translated, published and distributed around the globe during the great period of English colonization. It is to the colonizing English-speaking peoples that so many of the global masses owe their very education to the point that they may read and comprehend the Word of God. This includes the indigenous people of Australia. More importantly, during the greater portion of the 20th century, it was from the English-speaking nations that the true gospel message of Jesus Christ was published and broadcast to all nations in fulfillment of Christ’s own prophecy of Matthew 24:14, even broadcast from coast to coast in Australia, under the ministry of Herbert W. Armstrong. 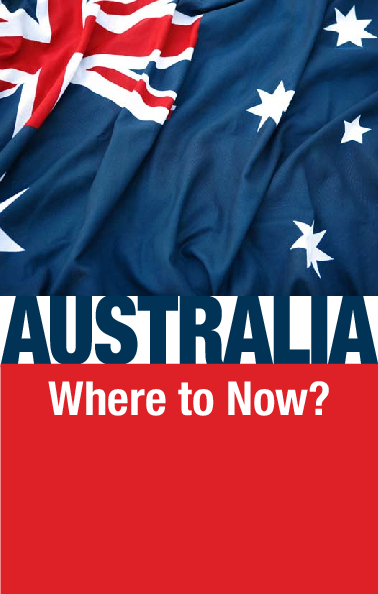 Now, through the Philadelphia Trumpet magazine and the television program The Key of David, that message continues to be disseminated to all Australians willing to heed and respond. Part of that message has to do with the very identity of the Australian people and with their nation’s ultimate destiny. You owe it to yourself to study Herbert W. Armstrong’s book The United States and Britain in Prophecy. It’s a real eye-opener, its message underpinned by a plethora of proof as to Australia’s true identity, its divinely ordained history, and the incredible future Australia is yet destined to fulfill!